The 'Mango' is the National Fruit of India. It is a sweet fruit. It is a common fruit of our country. It is a seasonal fruit, too. 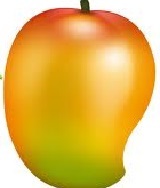 The mango is a fleshy stone fruit belonging to the genus Mangifera. Mangoes are rich in vitamin A, C, and D. It is also called the king of fruits. It is generally found in the summer season. Mangoes are grown commercially in a large orchard. There are over 100 varieties of mangoes in India They are in various range of colors, sizes, and shapes. The popular kinds are the Langra, the Gopalbhog, the Fazli, and the Ashwini etc. Malda District, state of West Bengal in India are famous for mango in our country.